My favorite “seasonal” treat is Hot Chocolate or Hot Cocoa. Rich and creamy with that heavy warm scent of chocolate – nothing beats it! Those of you who attended my Holiday Socials at The Green Grove might remember that I liked to do a whole hot chocolate tasting menu! Milk chocolate, white chocolate, red wine chocolate…and a whole bar of toppings and add ins! Today I am doing a little bit different kind of hot chocolate. One for your skin! Cocoa Butter is the base of this recipe, and not only does it give it a delicious chocolate scent and this luscious silky feeling but it is also amazing for your skin! Proven to reduce scarring, calm inflammation, and be very moisturizing. The fatty acids in it, oleic acid, palmitic acid, and stearic acid, work as antioxidant compounds that are beneficial for the body and help to neutralize free radicals in the skin. Watch the video or scroll down to learn how to easily make this yourself! Optional: Essential oil of your choosing – some suggestions: Cinnamon, Peppermint or Orange. – Warm up double boiler. Gently melt cocoa butter over heat. – Once cocoa butter is melted whisk in cocoa powder until well incorporated/slightly frothy. – Stir in coconut oil until melted. – Remove from heat and put into bowl for cooling down. Let it sit at room temperature or pop it in the fridge or freezer (10-20mins) until it is a semi solid consistency. Like a soft butter or cream cheese. * if it gets too solid from the fridge/freezer, let it sit out a bit to soften. – Put in mixer and whisk on low until it starts to look slightly whipped. Roughly 3 minutes. – Add in Jojoba Oil, Vitamin E Oil, and optionally 2-4 drops of essential oil. – Turn mixer to medium high and whip for 10 minutes or until it becomes light and fluffy like frosting. – Put into a container and enjoy! This will keep for about 3 months without a preservative. You just want to be careful of not letting it get too warm (it will melt) or too cold (it will become solid). A cool room temperature out of direct sunlight is perfect. I hope you enjoy this! I have two more holiday inspired DIYs to share with you this week so stay tuned. It’s been a long week of holiday season coming and going, the weather is chilly, your nose is getting stuffy and you are ready to relax! A nice relaxing bath with a bath bomb or salts sounds wonderful – except you have no time to draw a bath. You can maybe grab a quick shower before you need to be on to your next task. But that doesn’t mean it can’t be a spa like experience! Shower melts, also known as shower fizzies or aromatherapy tabs are an awesome way to make your shower time more luxurious. While your shower steams up, the shower melt begins to break down filling your bathroom with an aromatherapy experience. Aromatherapy has been around since ancient times – Egpytians distilled fragrant oils, Romans loved herbal bathes. While the term wasn’t coined until the 1930s there is evidence throughout history of using the aroma of plants for health and wellbeing. Shower melts are extremly easy to make. Using a cute mold to shape them and packaging them up in a mason jar with a bow can turn them into a festive gift for your family and friends who love a scented holiday gift. Most of the ingredients and tools are probably in your home already! Step 1: Mix dry ingredients together (baking soda and cornstarch), sifting or whisking until there are no clumps. If you have sensitive lungs, consider wearing a mask or holding a towel over your mouth and nose while pouring them as they can dust up. Step 2: Slowy add the witch hazel to the mix. Start with 3 tablespoons and continue to add until mixture reaches a wet sand like texture. You don’t want the mix too wet or else it won’t set. Note: There will be a reaction in the ingredients which makes it start to clump together. You will now add the essential oils and coloring but you will need to really mash it together with a spoon until it is all well mixed. Step 3: Add 3 drops Tea Tree oil, 5 drops Peppermint, and 10 drops of Eucalyptus oil. You can add up to 30 drops for a stronger scent but these are strong essential oils and can be overpowering. I chose these three oils because they are great for the chilly weather season. Eucalyptus aroma is known to loosen phlegm and aid in easing congestion, Peppermint is uplifting, and Tea Tree helps stimulate the body. The combination smells herbal but not too medicinal. WARNING: Eucalyptus and Peppermint oil inhaled are not suitable for children. Please look into the safety and usage of essential oils with children. Step 4: (Optional!) Add 2 to 5 drops of food coloring. Step 5: Mix everything til well combined and then press into your silicone mold. Pat away excess moisture with a paper towel. Place your melts into the freezer to harden overnight. All done! Pop them out of the molds and you are ready to go. Store them in a COOL DRY place or else they may melt on their own. Put them in a mason jar, tie a bow and you have an adorable holiday gift! 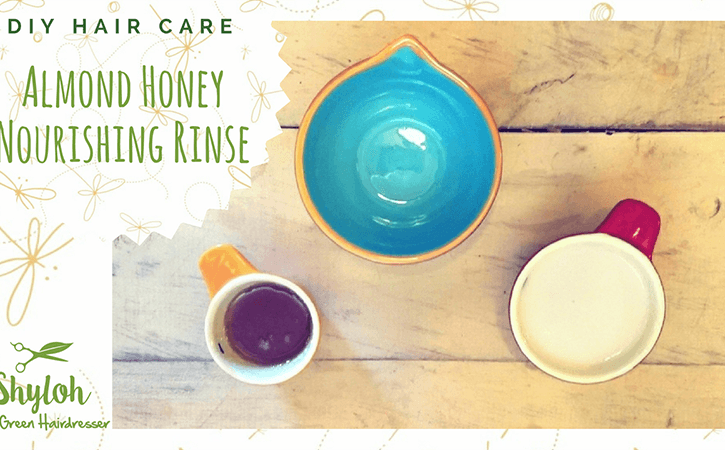 Nourish your hair with this super simple at home hair rinse! Almond milk helps soften brittle hair with its abundance of fatty acids while also containing a big punch of protein and vitamins A, B, D & E.
And honey is an amazing ingredient for your whole body. In this recipe it is working as a humectant, pulling water into the hair and cutting down on frizz while it smoothes out the cuticle layer of the hair to give it a beautiful glossy shine. If you have scalp irritation this is a great soothing treatment to massage into the scalp as it will gently break up dandruff and dry skin while calming inflammation. This DIY hair rinse is simple and suitable for all hair types. Watch the video below to get the details on how to make some for yourself! 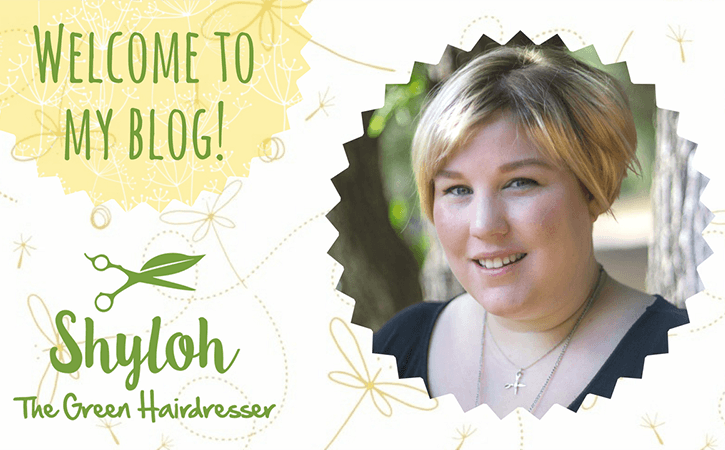 Welcome to my new blog where I will be sharing information about living a green beautiful life! You can look forward to indepth explainations on ingredients, beauty tutorials, product reviews, tips and tricks and more!